A drive is a drive, right? Not at all. Allow us to explain the differences between SSD technology and HDD technology. Hard disk drives (HDDs) are primarily found in computers and laptops. Solid state drives (SSDs) are becoming more common in computers and laptops, and are also found in tablets, cell phones, portable drives and mp3 players. Consider the familiar USB memory stick. A solid state drive is a larger, more sophisticated version of your traditional thumb drive. Like a memory stick, the SSD stores information on microchips and contains no moving parts. Meanwhile, a hard disk drive records information on a storage platter by moving a mechanical arm with a read/write head over a spinning platter. The platter inside the hard disk drive is coated with a magnetic media which records data in binary code (1's and 0's). A solid state drive does not contain magnetic coatings. Instead, SSDs rely on an embedded processor, or "brain", and interconnected flash memory chips that retain data even when no power is present. When destroying HDDs and SSDs that are no longer needed, their technology must be taken into consideration. A degausser has the ability to erase information stored on a hard disk drive because it is magnetic media. However, a degausser will prove ineffective at erasing data from a solid state drive, because SSDs do not contain erasable magnetic coatings. Instead, solid state drives should be physically destroyed with a device like the SSMD-2MM Solid State Media Disintegrator. 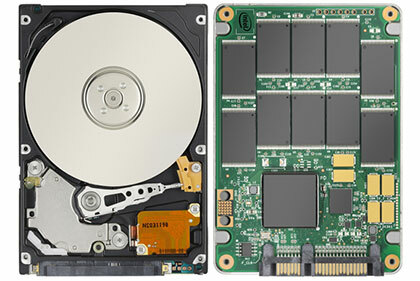 [Above] A HDD with magnetic platter (left) and a SSD with microchips (right).